If you want to add a link back from your gallery (for example, to your gallery index or to the main page of your site) go to the Options step, the Thumbnails pages tab. In the Link back from the gallery section check the Add <link back> to the thumbs pages box and enter the link back address into the Address field. This address can be either absolute (the full address starting with http://) or relative - it's up to you. 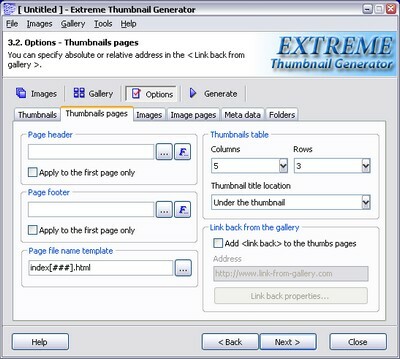 Please note, that the Link back from the gallery section is only available if the text of the thumbnails page template or thumbnails page navigation menu template contains the [#thumbspage.link_back#] special tag.